Tetyana Bilorus’ first boxer appeared in her life as a pet in 1989. Her breeding experience began a few years later, when she acquired Aylia who produced three litters. In 1996 Tetyana made her debut in the show world with her Hungarian import Angel fon Spartacus. Her boxer breeding kennel Brist Art Nordom was founded in 2004, and have gained top titles such as World Champion, Young Champions of Europe, ATIBOX Champion, Junior Champion ATIBOX, Champion of Ukraine and other countries. Her Germiona NorDom became World Champion and Best of Breed at the World Championship 2009. 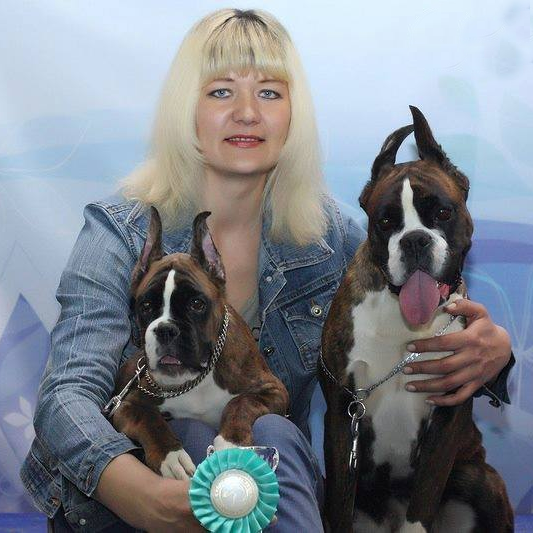 Tetyana is a FCI Judge, Vice President of the Ukrainian Boxer Breed Club of Ukraine, Member of the Kennel Union of Ukraine and the Head of the Boxer breed in the Donetsk branch of UKU in addition to being a Training & Breeding Instructor.